What falls in the fall ? We have been singing a song by Laurie Berkner called ” What falls in the fall?” It talks about rain falls , temperatures fall and leaves fall. At the very end the KIDS FALL. They love this song. Music is a great way to teach children. Temperature is a very complicated word for a child but when sung in a song it comes out easier. 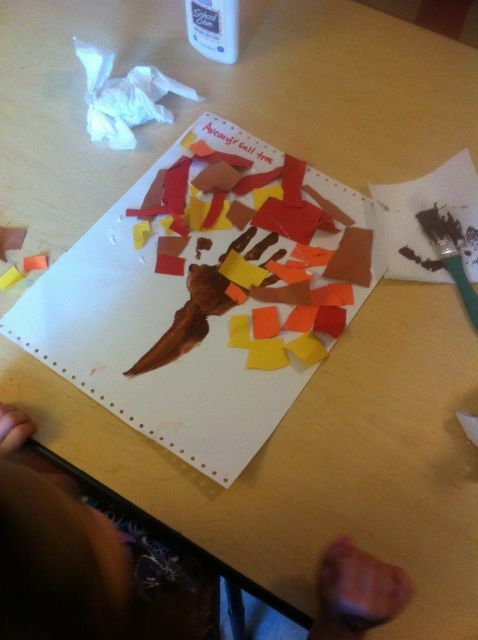 Today one of the art projects the kids could do was another fall tree. This one used cutting skills again. 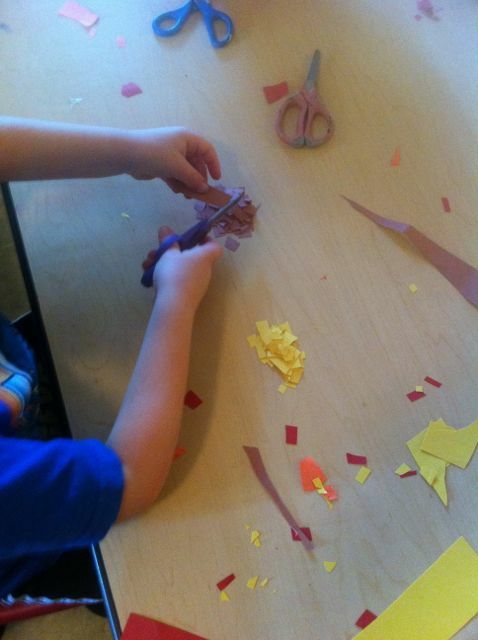 Cutting isn’t an easy task for three year old fingers. Things you can do to help your child develop those muscles more is playdoh play and tearing paper. The kids took fall colors and cut out squares to be the leaves on the tree. We painted their hand and arm to be the tree truck. It was funny to listen to the kids as we did this . ” that tickles me” . We heard that a lot. One thing as a teacher I found very interesting was the difference in cutting for genders. Normally the boys are less interested in artsy projects. They prefer blocks or cars. Girls LOVE art. 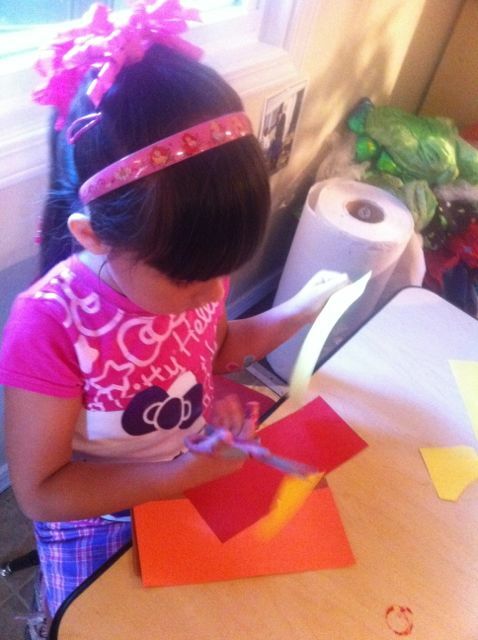 Today I noticed the girls cut large shapes from the paper for leaves. Many of the boys cut little tiny pieces. I was impressed with the focus they had at the table. 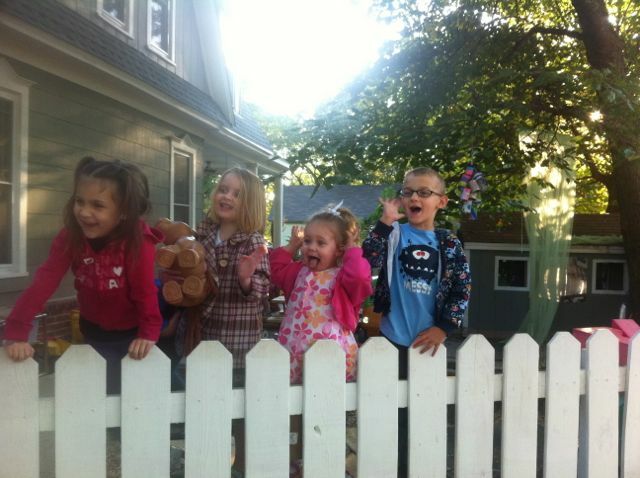 This morning I was outside for a while with the kids. Since we split into two groups and do circle time during the split , I don’t do outside duty. NOT SO BAD on cold yucky days or scorching HOT days but on beautiful fall days like today , I am jealous. I love watching the kids interactions during outdoor play. 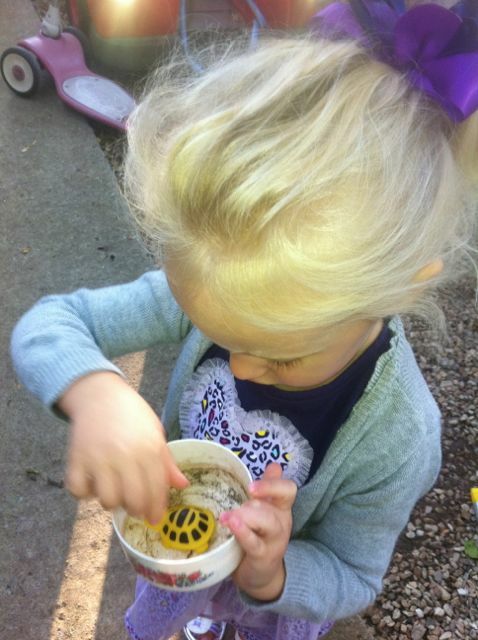 Kaitlyn had a turtle ” plastic” in a bowl that was very important to her. 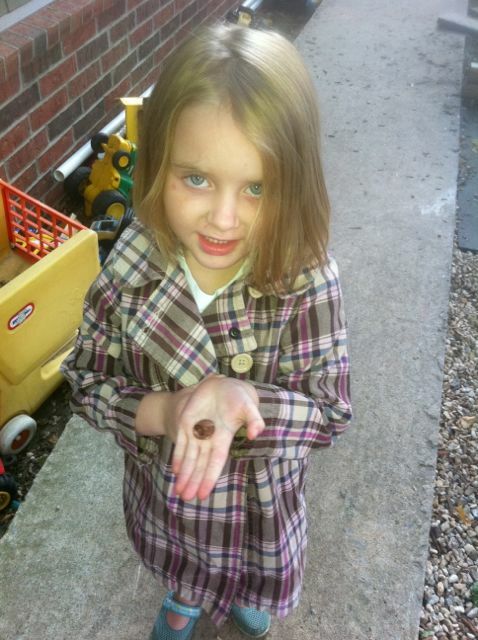 Scarlett was so proud of her shiny new penny that she wrapped it in a paper for safe keeping. The kids LOVE standing on the word working area to wait for their friends to arrive and I caught a picture of them acting silly with Mr. Randy. 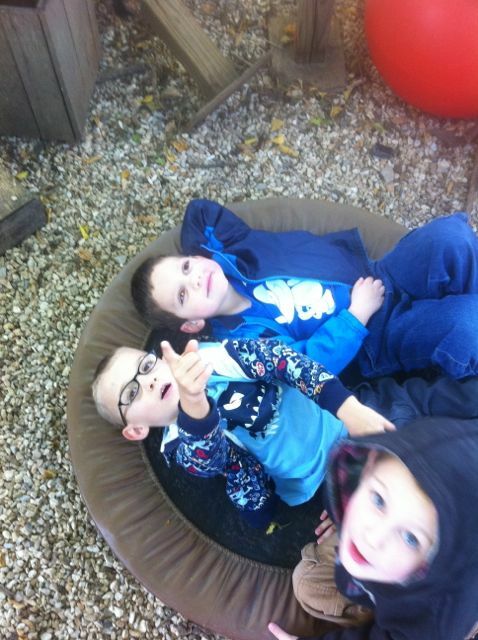 I love the picture I have of the boys lying together on the trampoline and watching the wind chimes. One of our awesome moms dropped more teaching aids today. YAY! 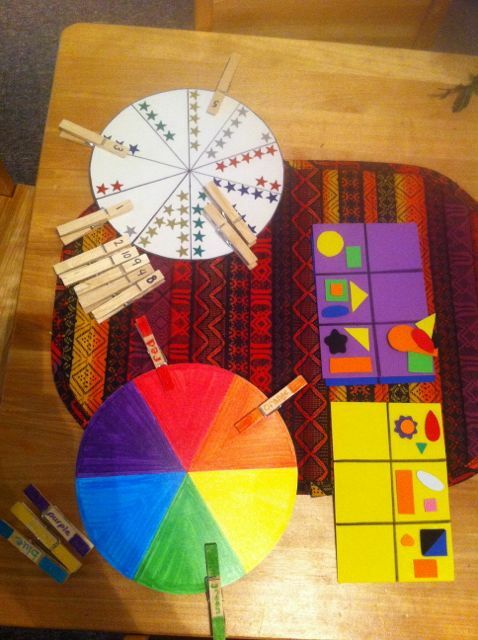 The kids LOVE homemade teaching aids . Thanks Melissa! 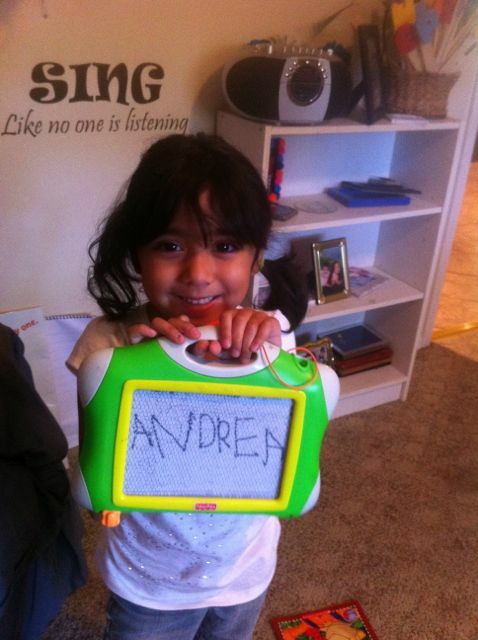 Andrea was really proud that she wrote her name today! WAY TO GO ANDREA! Next step is teaching her to use an upper case A and lower case for ndrea. I am so proud of my kiddos! Now, a video I took of the boys laying on the trampoline this morning. This was a precious moment in time. 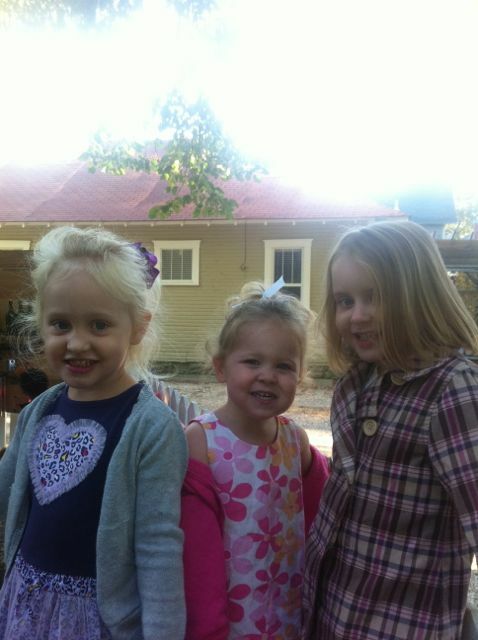 The kind that makes you go….. ah… I love my job. Click here for the video. I haven’t figured out how to embed them yet.